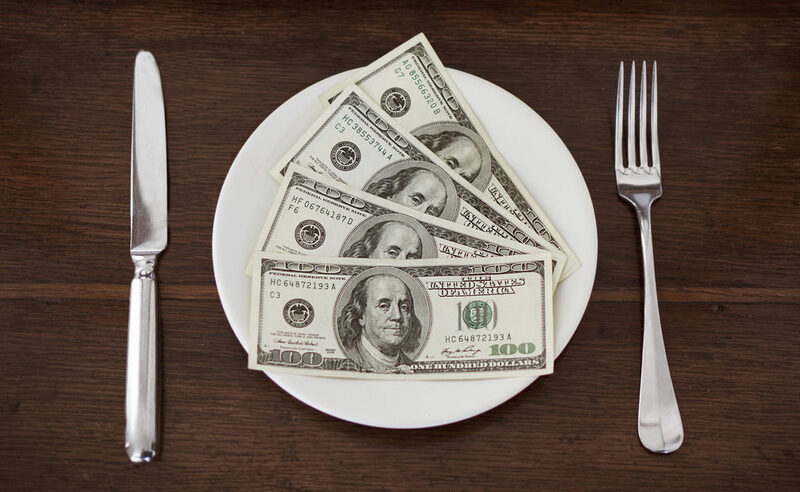 Restaurant Meals: Delicious, Healthy, & Only $225 per meal! Who knew? That’s not a typo. It’s a New York Times story on famed chef David Bouley’s new project restaurant that espouses his new food philosophy: that eating should have three components: it should be delicious, be healthy, and be eaten communally. Great, Chef David, but probably only 0.001% of the community can afford your food. No wonder the restaurant’s capacity is only 24 seats. That tab doesn’t include tax, tip, wine, or even waiters. Drop your fork and get another one yourself in the drawer below your place setting. Now that these chefs have attained the nutrition nirvana, they want to tell the world. The also have new restaurants to promote, both of which will be serving healthier dishes that reflect their new nutrition enlightenment. Chef Joel must think his dishes are healthier than Chef David’s, as his 9-course tasting menu costs a whopping $325 per person, although if you go vegetarian, it’s a mere $145 per person. “My menu is full of antioxidants and nutrients now.” Great, but at $325 a head it should also come with a parade in the customer’s honor. At least it comes with waiters. I’m very glad Chef Joel lost the 60 pounds. Bravo, Chef, and please maintain the lower weight. Elevated cholesterol, blood pressure, blood glucose? Probably due to his weight as much as his diet. If he’d gotten obese eating a Med diet, he may have suffered the same blood profile. Losing 60 pounds on ANY diet will improve your blood profile. he headaches probably disappeared because of his weight loss, not the butter, Joel. Chef Joel, you’re eating better, but move a little more, too, in a focused way. It’s the next step in your healthier lifestyle and do it. We’d like you around, even if we can’t eat at your restaurant. I’m sure the tasting menus at these restaurants are delicious. I’m also sure most of us will never be able to afford them and we need to get over it. Fear not, there are plenty of ways to have a healthy diet that don’t involve fancy restaurants and kitchens with tweezers. And yes, you can even include red meat, and pretty regularly if you like. See my “Off the Record” post for a great (and great looking) steak dinner that I cooked on a weeknight in less than 30 minutes and. You don’t need a pro chef, just a few tips. It’s delicious, healthy, eaten together, and just as enjoyable. It’s for the other 99.99% of us who will NEVER eat there. No one should EVER think they can’t make a really delicious and healthy meal that is still is budget-friendly. Forget the fancy frillery, all the research that shows the benefits of a diet with lots of fruits and veggies, whole grains, nuts and healthy fats, that was all done with regular supermarket produce. Forget Chef Joel’s credo about “only organic avocados.” The best avocados are the ones you can afford and that you’ll eat. No food is nutritious until you eat it. One great comment from Chef Joel: Once you establish a diet, you can make exceptions. Once you’re able to balance it out.” Chef Joel, now you’re sitting at OUR table! http://cuttothechasenutrition.com/wp-content/uploads/2016/10/logo10.png 0 0 Keith-Thomas Ayoob http://cuttothechasenutrition.com/wp-content/uploads/2016/10/logo10.png Keith-Thomas Ayoob2017-11-11 19:14:402017-11-11 19:14:40Restaurant Meals: Delicious, Healthy, & Only $225 per meal! Who knew?